EIDAL, ROY EIDAL, THE EIDAL GRINDER, THE EIDAL SHREDDER AND MORE. Dan Burda calls this design the Eidal vertical grinder, or the eidal vertical shredder. The name can not be taken away , this machine is a Vertical Grinder or a Vertical Shredder. It is often called an Eidal Vertical Grinder or the Eidal Vertical Shredder. Other historical names used for this machine are the Eidal Vertical Grinder or the Eidal Vertical Shredder, circa 1983. And, the Eidal-Hitachi Vertical Grinder or the Eidal-Hitachi Vertical Shredder, circa 1997. No matter what the name, it’s still the Eidal shredder or the Eidal grinder. The product line was invented and patented by Roy Eidal of New Mexico and is owned by Dan Burda and his family group of recycling equipment companies. Today is 2012, after 45 years the Eidal vertical grinder is still used to process waste materials, much like the Saturn shredder brand of slow speed high torque shear type shredder that was pioneered by the Burda family, the Eidal shredder brand of vertical grinders and vertical shredders has been refined and re-applied beyond Roy Eidal, by the Burda family. The Eidal Vertical Grinder or the Eidal Vertical Shredder or the Vertical Grinder or the Vertical Shredder was invented in the early 1960’s and patented in 1966 by Roy Eidal of Eidal Heavy Industries of New Mexico. It appears from documents collected over the years that Roy Eidal had the Dravo Shipyards in Pittsburgh design the concept for his company. The first placement of the original machine is not known but may have been involved with the Alter Company of St Louis for metal shredding as there is some connection to this group and the Eidal shredder. The product line was not evolved from small machines to big machines. The product line was built big at first with a 750 hp and even a 2000 hp. Smaller models like the 400 and 200 and 100 series were made at a later date. The machine was paired with the Panning Ripsteel unit for metal shredding and was a major pioneer in the first concept of pre-shredding and then densification shredding systems. This Eidal International industrial conglomerate was put together under the leadership of the visionary direction of Roy Eidal starting in 1943. The primary business was heavy haul trailers for the oil field industry and for heavy haul trailers for military vehicles. WHY DID ROY EIDAL DESIGN A SHREDDER? That may be lost in time and in history. The answer was never found. Upon the death of Roy Eidal, his conglomerate was sold to various groups with the Eidal International Shredder Division being purchased by the Burda Group of Companies in 1983 from the Carborundum Pangborn Group of Hagerstown Maryland. At that time, there were about 150 Eidal Grinders in the USA and about 300 Eidal Grinders worldwide outside of the United States, mainly in Japan. By 1990 there were about 450 Eidal Grinders in the USA processing wood waste and scrap metal for General Motors, general waste for Merck and RDF production for the City of Chicago and the City of Atlanta. As outlined above, this product was licensed to the Hitachi Heavy Industries Group in Japan to build these machines for the Japanese environmental market. The basic history of the Eidal Shredders and Eidal Grinders or the Eidal or the Eidal-Hitachi Shredders has evolved over time. Patent Documents show that the Eidal Vertical Grinder and Shredder technology came to life in 1966 with multiple patents and even the issuance of the Dravo patent confirmaing that there was bad blood between the two groups for the product lines success and money. This unique and first patented machine using this special design was originally filed and issued to Roy Eidal and was included in a shredding system to process automobiles into scrap for the steel industry. Also shown in this patent is a car flattener, using a hinge concept that was also a pioneering design in this industry. That concept was successfully copied and commercialized by the Aljon group of Iowa. Our data shows that Williams, Eidal and Newell were all pioneering patents and concepts for car shredding based on patent applications by these companies for processing scrap metal from cars. There were two basic designs that evolved from these original three technologies: The horizontal hamermill, the vertical hamermill and the car flattener. The Car Shredder owes its history and evolution mainly to the Eidal and Williams and Newell Family Groups of the United States. Others have followed but most have evolved from these original designs being copied or stolen from the original owners and inventors and then made by others who claim the stolen technology as their own. The shear shredder industry evolved much in the same way with the INVENTION and COMMERCIALIZATION of the slow speed shear shredder by the Burda Family in the early 1970 era. Today the original design is copied by 500 companies around the world. The Eidal Vertical Grinder or the Eidal Vertical Shredder is copied by only three other companies. It uses the concept of a ring mill or hamermill for shredding of material, the big difference in this basic technology is that the rotating member is built on a vertical shaft rather than the traditional horizontal mounting common to these machines. Basic Concept – The design allows the material being processed to flow from top to bottom using gravity while being shredded. This unique feature almost eliminates the need for a sizing screen or screen assembly in the machine but there are designs that we have used where a screen or choke ring in the machine has been used much in the same manner as other types of sizing screens or grate systems. One main feature of this machine is that its designed to process scrap metal as well as other waste materials that were often difficult to shred or process in other types of shredders. These machines were originally applied to the processing of scrap metal and solid waste materials. Today they can process, almost anything that the world makes: metal, plastic, wire, paper, wood, etc. Today they are Combined with Pre-Shredders that have greatly expanded the use of these to include WEEE and Auto Scrap and ASR and Electronic Waste as well as Green Waste and Garbage. The new field of “scrap tire wire cleaning” is one of the best and new fields for this technology. ASR or Auto Shredder Residue processing is also a perfect application for this machine. The Eidal Grinder or the Eidal Shredder, combined with automated sorting systems and gravity separation systems and eddy current separation systems has extended its success for full processing lines. The Eidal Shredders and Grinders have a place in history as being a major design innovation and technology and new invention of this modern century, for waste processing equipment, along with the Granulator and the Shear Type Shredder . The hamermill is also in this category although it has been in the field of crushing and pulverizing materials for many years before the advent of the Vertical Grinder and the Shear Type Shredder into the commercial world of shredding. The machines that have been invented since the 1900’s for application in the recycling of products are in five main groups. These new inventions and major innovations and commercialization of shredders for recycling applications are the Fred M Roddy Granulator, the Williams-Eidal-Newell Car Shredder, the Vern Burda – Dan Burda Shear Type Shredder, the Roy Eidal – Dan Burda Vertical Grinder and the Shred-Pax – Dan Burda G 12 Rasper and the Euro – Sotsky Single Shaft Grinder. But, there are many more. The Panning-Eidal Pre Ripper, The Holmann Rouse Shredder, The Coats-Burda Mini Shredder, The Voigts-Burda Debeader, The Farrell-Burda Tire Cutter and many more inventions and pioneers in this field. Today the Eidal Burda Shredderhotline Shredding Systems are built around project requirements and customer preferences. Everything down to the colour. HOW DOES THE VERTICAL GRINDER WORK? The machine has a spinning centre core rotor that has an upper section, or knocker section that in the early days of this industry pre sized the material before transition of materials down through the main grinding or shredding assembly. Today this upper knocker section is provided in single and dual knocker designs as well as other type fluff and whipper designs that assist with the pre-shredding and feeding of the unit. Today Pre-Shredding is a major key to the increased success of the Vertical Grinder. Pre-Shredders process materials to the proper size before introduction into the machine for final sizing. 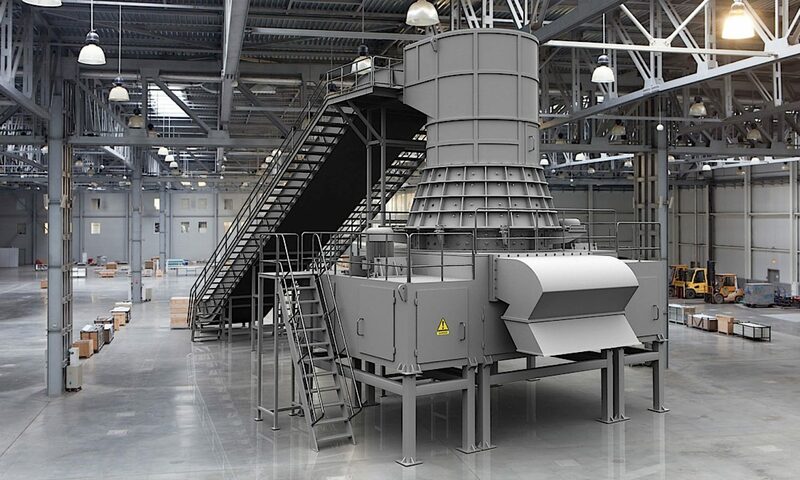 The V100 the V200 the V400 the V750 the V1000 the V1500 and the V2000 are some of the models in the Eidal Vertical Shredder product lines. The rotor turns at 500 rpm with a tip speed of over 120 miles per hour and the massive design of rotating steel rotor, mashes and twists and knarles and wraps and tears anything that is thrown into the machinery. With Top, and Middle, and Bottom Bearings, the design has changed over the years into an engineering marvel. The machine has an outer Tub that has four basic design configurations.. The machine is built like an old battleship or an old battle tank. Various alloy steels are used for the machine and various types of wear parts and wear steel are used in the design. The design includes a ballistic hopper and tub and discharge assembly. The design includes explosion and unshreddable ejection hoppers and tubs. The design is made for heavy duty shredding . We process ammunitions in this machine, live ammunitions, that explode and do not damage the machinery. These machines meet all demilitarization standards, which is for 100% mutilation of components. We use Top quality components in this machine such as Siemens motors, SKF bearings, Siemens PCLs and Telemechanic electronics to ensure reliability, ease of maintenance and worldwide component availability. This is more data on this Eidal Grinder or Eidal Shredder..
We often call this machine by many names…. WE CALL THEM….THE EIDAL VERTICAL GRINDER OR THE EIDAL VERTICAL SHREDDER. Most Shredder or Grinder Groups offer one or two basic designs within their main single shaft grinder product mix. We offer thousands of designs. This is another design of the main rotor of the unit and is made to reduce weight and cost in most machines but also allows for high outboard inertia of the rotor when high speed rotation is needed or used.